So you may have noticed I had a little break from my Love the Little Things posts. There was no blogging done at all the week Me and the Froglet spent in hospital, there was not a lot of little loves that week if I’m honest. Then I’ve had a couple of weeks settling in having the baby home and learning to live with a newborn again! Although I’m still learning, massively, and life owning a newborn and a nearly 6 year old is going to take some adjustment I felt ready to restart looking for Little Loves each week. This is my first week back, I’m not sure how easy it’ll be as I’m still pretty housebound but here goes! I’ve been reading quite a lot of blogs and popping by catching up on some linkys that I join in with. Apart from that, the only thing I’ve really read is the little local life booklet that comes through the door telling me about everything that’s going on around my area, I actually find it really helpful as different community groups advertise events they’re putting on that otherwise I’d miss. I went to watch the Munchkin in her little after school dance show! I thought it was really sweet although the munchkin gets all shy pants and giggly. I was very proud! Apart from that I’ve mostly been watching trashy day time TV. If I’m honest, I usually just have it on in the background although I am becoming a fan of Philip and Holly. The munchkin was making a song up about how Rainbows (mini brownies) rocks. She even made a dance to go with it and roped Mr C into joining in! 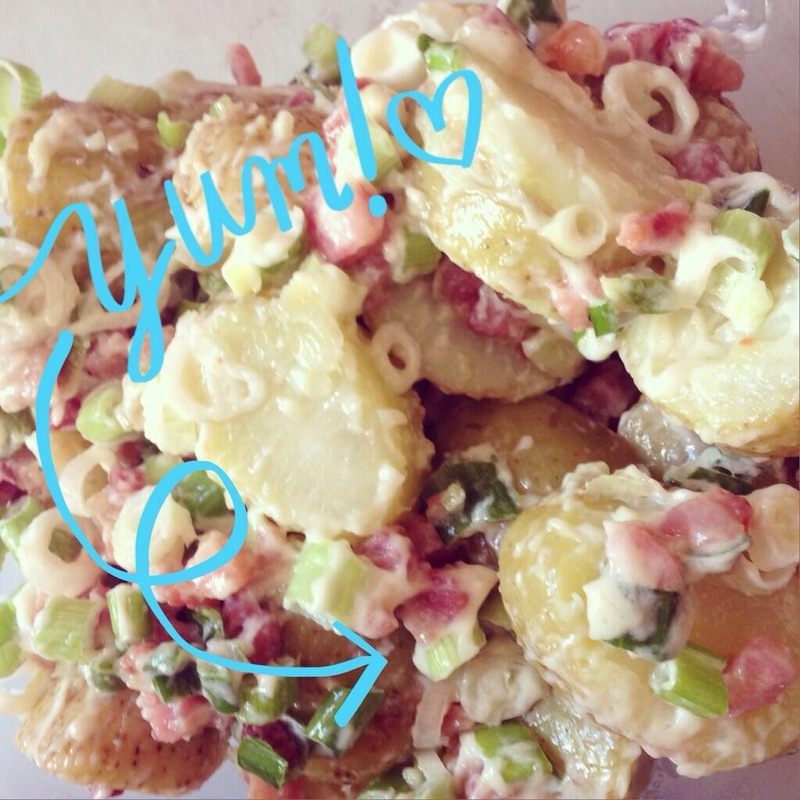 We had a BBQ this week and I made this delicious potato salad, it’s really simple to make but scrummy! I stole to recipe from a friend and I’m so glad! I could eat this by the bucket load!! I’ve mainly been wearing dresses. Trousers are still a little tight around my tummy where I had the cesarean, plus it’s been lovely and sunny and definitely dress weather! Monday was my 8th wedding anniversary. If I’m honest we both forgot in our defence there’s has been a lot going on. We had a lovely BBQ for our tea. I would eat my dinner outside everyday if I could!! Happy wedding anniversary lovely. That potato salad looks so yummy!